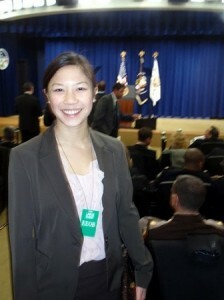 Yesterday, amidst a string of phone calls with banks and trustee’s attorneys, one call caught me by surprise in the best of ways – an invitation to come to the White House to hear President Obama and Vice President Biden give an address on the nation’s progress so far under the economic stimulus package. When? Today — the one-year anniversary of the Recovery Act. Through funding provided by the Recovery Act, I was able to join Legal Aid’s Consumer Law Program in October 2009 as an Equal Justice Works AmeriCorps Recovery Fellow. My particular fellowship was created by a partnership between Equal Justice Works, the Institute for Foreclosure Legal Assistance (IFLA) and the Corporation for National and Community Service (CNCS) to increase legal representation to homeowners at risk of foreclosure. 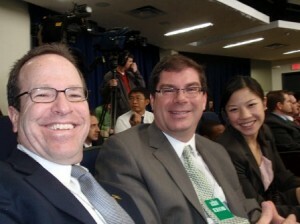 I attended today’s White House event with David Stern, CEO of Equal Justice Works, and Cole McMahon, EJW’s AmeriCorps Senior Program Manager. 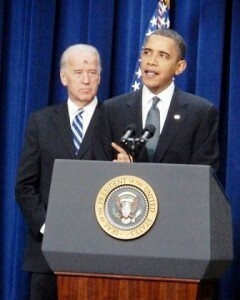 During his address, President Obama hailed the one-year anniversary of the passage of the economic stimulus and recovery package, acknowledging at first that the measure had not necessarily been politically popular, but then proceeding to highlight the benefits and successes of the package one after another. From widespread tax breaks for working Americans, to job creation, to investment in progressive technology and infrastructure, the president noted the many ways in which Recovery Act funds have been used to address the deep economic trouble facing the country when he took office. President Obama stated that the Recovery Act is largely responsible for the country averting a second Great Depression, noting that the economy has gone from shrinking by 6 percent to growing by about that same figure. Vice President Biden’s remarks conveyed a consistent message – the Recovery Act is working. Here at Legal Aid, we have seen some of the benefits of the Recovery Act first-hand, most notably with the dramatic expansion of our Consumer Law Program, which launched in September 2008 with the addition of Wendy Weinberg as supervising attorney. Thanks in large part to the Equal Justice Works AmeriCorps Recovery Fellowship program, Legal Aid’s foreclosure practice is now able to serve low-income homeowners not only through litigation, but also through mediation with servicer banks to obtain mortgage modifications and through extensive community education and outreach.